To have the Water garden or Koi pond of your dreams you have to have the right equipment. That might mean a small submersible pond pump or a big external pump. However, there are so many types of water pumps for ponds that it is easy to get confused and end up buying the wrong one. Choosing the wrong pump can turn out to be an expensive mistake which, in the worst case, would require you to buy a new pond pump and waste time and money. But there are so many things to consider. The Initial cost of the pump, how expensive it is to run, how long it will last and is it the right pond pump for the job in the first place? I will explain about different types of pond pumps that can be used. 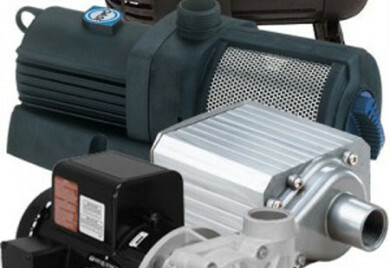 You’ll also find important information that will guide you in selecting the best possible water pump to suit your pond. Submersible pumps can be installed directly in the deepest part of the pond, in a pond vault or in a skimmer box. 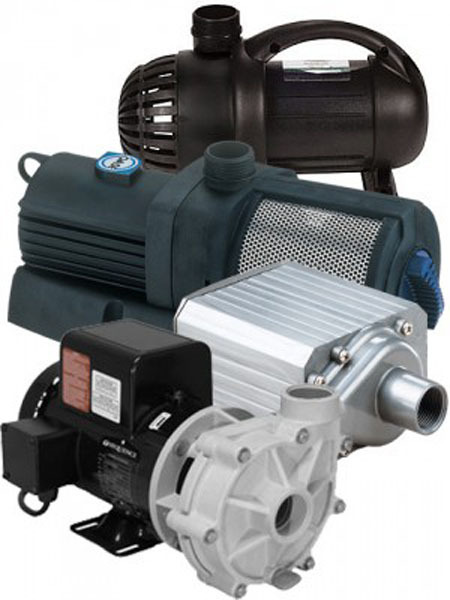 These pond pumps are quiet and are very easy to install. Submersible pumps are available from 50 to 50,000 GPH and are usually the preferred choice for small ponds. One word of caution with submersible pumps, some contain oil still so there is a risk of the seal leaking and it spilling into the pond. This can be a major problem if you have fish or other wild life in the water garden. External water pumps are the preferred choice for larger ponds (above 1000 gallons) because of their power and reliability. They can be a bit more expensive if you get an energy efficient one but it will be well worth it. You can even get external pumps that have two speeds. The low speed to run your filter 24/7 and a high speed to flush out or clean your filter. External pond pumps have an added advantage when it comes to the pond maintenance as well. Because they are located outside the pond, it is easier to open it and clean it without having to go into the pond. Magnetic Drive pumps require the least amount of maintenance and are very energy efficient in their operation. They do not require any sort of lubrication for their functioning. One thing to note is that magnetic pond pumps may not have as much head pressure so they may not be the best choice for pushing water up to a large fountain or to a tall waterfall. Or you may need to over size it to make up the difference. But they are the best choice for most submersible needs. Direct drive water pumps are more expensive to operate but tend to work well with ponds that have a fountain or a waterfall. However, if these pumps break down it would require a professional to fix them as they can be quite difficult to repair. If you live in a place which has a lot of sunlight through the year, solar powered pumps for ponds could help you save a significant amount of electricity costs. Also a great option if you do not have electricity in the area that your pond is in. But Solar powered pond pumps are still very expensive and come in very small sizes. And unless you buy a power storage unit as well it will only work during the day, which will not work if you have fish in your pond. If you need to empty your pond for a cleaning this is a good pump. Although not meant for continued use it is good to remove debris from your pond. Green time of year! Time to Add New Pond Supplies And Pond Plants. How to balance your pond. Do you want a pond kit?